Miss Fury #s 1-4: Past, Present, and Future | DestroyTheCyborg! Miss Fury #s 1-4: Past, Present, and Future – DestroyTheCyborg! When I heard that Dynamite was releasing Miss Fury, I couldn’t wait to get my hands on that first issue. Why, you might ask. Simple, she is one of the first woman superheroes, premiering in 1941 in the Sunday comics as Black Fury, but coming to comic book form a year later as Miss Fury. Mike Madrid, in The Supergirls, argued that “Miss Fury was one of the most resourceful and fearless of the founding mothers of superhero comic books, but unlike her Debutante sisters who fought injustice, she had no real desire to be a vigilante or lead a secret life. Intrigue just seemed to cross her path, like a black cat” (7). 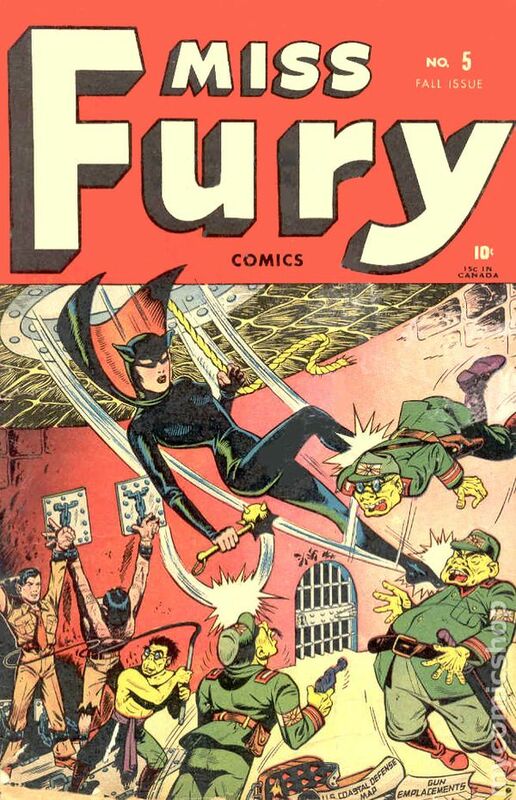 Not only was Miss Fury one of the foremothers of female superheroes, but she was also drawn by one of the few female cartoonist in the field, June Tarpe Mills. I’m thrilled to report that the Marla Drake (Miss Fury) of today is much like her predecessor. I’m guessing that writer Rob Williams and illustrator Jack Herbert have a great deal of knowledge of the first Miss Fury. We have a rich Marla Drake who seems to be more of a playgirl than a superhero, which is in line with the first Marla Drake. Other similarities exists as well. Many of the first women superheroes joined forces with their male counterparts to help fight against the Nazis and Japanese during WWII. Rob Williams has managed to take this to a new level. I really did not expect the Miss Fury of today to be up against Nazis, but she is, and soooooo much more. We are now four issues into the new series, and I’ll admit that I’ve still not completely wrapped my head around everything that is going on. Don’t expect to pick this issue up, read it, and understand what is going on because it’s simply not going to happen. If you are interested in reading Miss Fury, you will need to pick up all four issues and read them closely. There is the past, where Marla Drake is the socialite who doesn’t seem to really give a damn about anyone but herself (but we learn she was in love with a war hero who doesn’t come back); there is the present, 2013, where Marla is fighting the same, yet different war; and there is the future, where America seems to be losing a war they are not even aware of. Confused yet? Yea, this is why you have to start at the beginning and read closely. The first issue is particularly challenging, to the point where you might be tempted to put it down and never pick it up again. You start . . . well, I think we start in 1943, but then the time travel begins and the only clue that we get as readers is the single word “Switch”, and these can be easy to miss at times. On top of these “switches”, Marla also reminisces about her trip to Kenya and the acquisition of her “power”. Best advice is to read through this first issue and move on. It will all begin to make more sense the further you go in the series. With that said, however, I’m still unsure of all the players and their roles even after the 4th issue, but I’ll keep going with it because it has lots of potential.